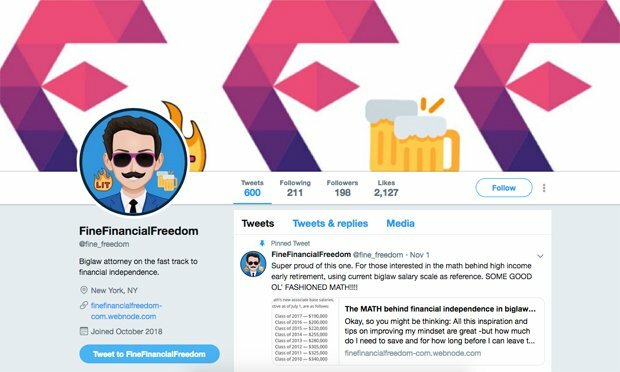 The FIRE movement (financial independence, retire early) is the focus of a the Twitter account @fine_freedom run by a Big Law associate. A new—and anonymous—Twitter personality run by a Big Law associate is taking on the big-spending ways some of his colleagues know all too well. The account, @fine_freedom, espouses a personal wealth lifestyle known as FIRE, which stands for “financial independence, retire early.” The subculture is all about saving money in the extreme as a means to becoming free from having to work for money. He recently answered questions in a Q&A with law.com. Hi, @fine_freedom. Thanks for visiting with us. We’d like to understand more about you and the seemingly counter-cultural moves you’re making with your money. First can you tell us more about yourself? You’re trying to keep your identity secret, but will you tell us, even in broad strokes, a little bit about who you are? Sure! As you can see from my Twitter and blog, I’m a biglaw attorney in NYC. I come from a pretty middle class family and I’ve traveled quite a bit for schooling and my job. I’ve always been into self improvement in many aspects like eating healthy, fitness, reading, and learning new things. When I find a new way to improve, I often go all in and stick to my new routine and adjust based on what works for me. I think this is the personality trait that brought me to, and keeps me involved with, the FIRE movement. Why are you into FIRE? For me, FIRE is about using money as a tool or a resource that can provide happiness and security for people and their families. The focus in the FIRE community is maximizing that resource to provide maximum happiness and security. I was introduced to FIRE when I started my first high paying job as an attorney. I was putting my excess money in a savings account without thinking much of it. When work slowed down a bit, I spent a lot of time researching what to do with it all. This led me to prominent FIRE websites like Mr. Money Mustache that really spell out the fundamental principles that many people follow in organizing their finances. If you were financially independent and didn’t have to practice law, what would you do? That’s a great question. I’m still pretty far away from FI, but it never hurts to think about these things. I might still practice law, but perhaps in a setting where I’d feel my work was impacting the types of people I’d like to help. Perhaps legal aid clinics or government work where the money isn’t great, but I’d be FI so who cares. If I left the law, it might be nice to get into teaching or working with my hands. Just goes to show that when you don’t need the money, the world has a lot more options. Do you dislike practicing law or working at a big firm? That might be a common misconception from my blog or Twitter account. I actually find my work fascinating and I work with almost exclusively kind and respectful people. That being said, the hours are extremely high compared to nearly any other career. As someone who values family and being there for the people in your life, it’s tough to imagine staying in the biglaw environment beyond a certain point. Some of the things you quote on Twitter stand out, the one about spending $85K a year on a nanny, in particular. What’s the culture like among Big Law associates? Is it all just spend, spend, spend? I wouldn’t say the over-the-top spending is ubiquitous, although I’m sure people in the FIRE community might disagree. Most of my “biglaw FI illiterate quotes of the day” are things that really stand out that I’ve heard amongst peers at one time or another. They are probably the outliers. That being said, everyone I know in this field spends more on things like rent, eating out, and gym memberships than anyone I know outside the field. #Biglaw FI Illiterate QOD: “With both of our work schedules being so crazy, we end up paying our nanny like $85k a year” YIKES! Are any of your peers in Big Law into FIRE, or even into being frugal? That’s a great question, and I wish I knew. I think when everyone knows each other’s salaries – and knows how high they are – it feels almost disingenuous to suggest an alternative to save money. I’ve told people things about investing and 401ks, which is more basic financial literacy than frugalness. I’d have to think there are a lot more than let on, but the idea that people would openly discuss saving money to presumably quit their job while in the office is a major deterrent I’d guess. Is this something you talk about at the office, or are you a closet FIRE person? What do other people think about it? I’d say I’m good about keeping my work life fairly separate from my personal life. I talk about all of this with the people closest to me in my personal life. Those people, my family and childhood friends especially, really keep me grounded from the luxury foisted upon you as a biglaw attorney at times. And it’s not firms’ fault – they have money and have luxurious catered events in halls and on rooftops. But if you don’t step back and remember that it’s a billion dollar organization doing a nice thing, you can really trick yourself into thinking this is what your life should be every day. How does your FIRE mindset affect how you practice law? Not at all. I’d always work hard for the people that are above me in my practice and our clients. That would always be the case regardless of if I knew I’d be FI in a month or if I spent every penny I make. FIRE mindset really applies to spending for me. It’s a mindset of “yes you can afford it, but you don’t need it, and it won’t really make you any happier.” The money is often better put towards saving and investments, so that if tough times come, I’d be prepared. Let’s talk about how you live FIRE out in your life. How much money are you trying to save to exit the rat race? I have a pretty detailed blog post about this, but I should note this is an extremely personal question in that everyone should have a different answer. One of the core principles of the FIRE community is that if you can accumulate 25x your annual expenses and invest it in the total stock market, you can safely withdraw 4% (your expenses) every year forever. The math behind this is solid and would work even if you invested and began withdrawing at the most inopportune moments in the stock market’s history. The trick is calculating your yearly spending for each year after you want to leave the work force. Again, the goal is not to sit on a beach and drink daiquiris, but in removing the need for mandatory work, it helps to assume you’ll earn no money after FI, even if you certainly will through other work and hobbies. For me, I’ve calculated that my ideal life could run smoothly with me contributing $60,000 per year, which puts my FI number at $1.5 million, a lofty goal indeed. But with diligence and the support of the FIRE community, anything is possible I suppose. Again, this is mapped out in the blog post I referenced, but in short if I can keep my job and hit my bonus hours for 5 years, I can basically hold any paying job under the sun for the next 5-15 years and still get to that number. Obviously it would be quicker if I stayed longer, but that’s the goal I feel most comfortable with. I doubt I do anything that has that reaction. I don’t own a car, but I live in NYC, so that’s pretty much the norm. I’ve limited my vacations to one domestic trip for each of the last two years, which has been helpful. I also refuse to buy any drink at a bar or restaurant over $8, which would only shock people in NYC. Also, I still use an iPhone 6s, which is pretty rare around the office, but not exactly earth-shattering. Probably rent. I live with a roommate, which helps, but it’s a very nice place with great amenities. I’d say that’s the area I could be saving the most where I’m not. Always room for improvement! Again, I know people who rented a $3,500 one bedroom by themselves during their first year as a lawyer, but I still consider this a splurge for me because I pay far more than any of my non-biglaw friends or family. I also buy one nice bottle of whiskey for myself (about $80) every so often. It’s totally unnecessary, but I justify it by telling myself I’ll go out for drinks less, which probably isn’t true. What else can you tell us? Have we missed anything important about you, FIRE and Big Law? I think I’ve said it all! The community aspect of this movement is top-notch. I’m in the early stages and I’ve felt nothing but support and enthusiasm. I think the thing to remember is that everyone’s experience and perspective is different, and this is just mine. I think whether you’re in the legal field, or any field, treating your finances as an opportunity to better situate your loved ones for the future is always a good idea. My account just tries to instill in people in my field and other high earning fields that we have an incredibly rare opportunity to do that to a much larger degree because of the high income. Staying grateful and being mindful about spending could really change your financial position and ultimately your life over a decade or so. Thanks for the opportunity to get the message out there!